I love Nine West Shoes. It's as if they took a mold of my long skinny foot and made shoes exactly for me. I'm never disappointed in the fit, comfort, or quality. 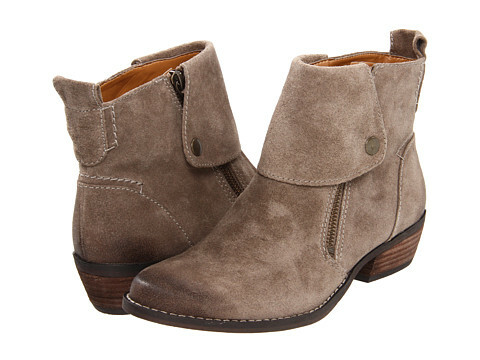 Case in point, the Bleaker Booties I just got on sale at Macy's. I was a bit unsure how I would feel about them (I purchased online) because they are a little on the country side. Luckily, when I received them, not only did they fit like a custom made glove, they are the perfect balance of style. You could definitely wear them Texas two steppin, but if that's not the look you're going for, they will happily morph to your needs. They are the perfect addition to my 80's-mod-rocker style. So much so that I just bought them in grey as well. They are available on Nine West's website in black too, and I'm kind of tempted to go for the trifecta I like them so much. Do you buy multiples of one shoe when you find a perfect fit?